The army said it found a huge amount of explosives in the building, and two of the four insurgents who were killed had jackets lined with explosives on them. NEW DELHI: The Bangladesh army said on Monday it has killed all four militants believed to have seized a building in an eastern city four days ago with a large cache of ammunition. Army spokesman Brig. Gen. Mohammad Fakhrul Ahsan said two bodies were found in the building in addition to six people, including two policemen, who were killed in explosions near the building earlier. Ahsan said the army found a huge amount of explosives in the building. Two of the four insurgents who were killed had jackets lined with explosives on them. 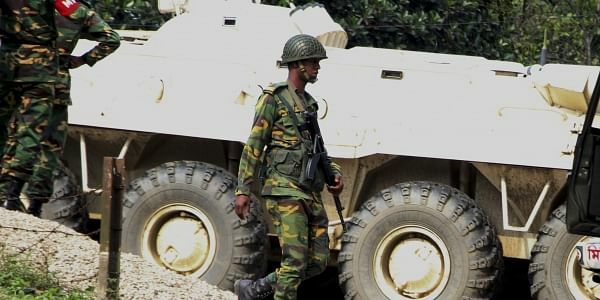 Army and paramilitary troops had been trying since Friday to flush the militants out of building in the city of Sylhet. The six killed Saturday died after a series of explosions took place on a road near an Islamic religious school and close to the building under siege. At least 25 people were wounded in the attacks and 78 civilians rescued from the building after troops broke a section of the compound wall where the building is located the army spokesman said. Several explosions occurred in the area, including a large blast Sunday afternoon. Police barred civilians, including journalists, from the area. The gunbattle with suspected militants came after a man killed himself on Friday by detonating explosives near a police post on a busy road near the airport in Dhaka, Bangladesh's capital. No one else was hurt. The Islamic State group has claimed responsibility for the attacks in Sylhet and Dhaka, according to the SITE Intelligence group, citing the Islamic State news agency Amaq. SITE monitors terror group activity online. Bangladesh has experienced a renewed level of Islamic militancy in recent years. Dozens of atheists, liberal writers, bloggers and publishers, as well as members of minority communities and foreigners, have been targeted and killed. Last July, 17 foreigners were killed when five militants stormed a restaurant in Dhaka's upscale diplomatic zone. The Islamic State group has claimed responsibility for most of the attacks. But Bangladesh's government has consistently denied the presence of the militant group in the impoverished South Asian nation, and says the attacks are the work of local radical groups.